Neil is a professional musician, producer, and film composer with over four decades of experience. A songwriter with a back catalog of more than 100 songs and more than 45 million records sold, he has worked with some of the greatest artists in the music industry, including Rick Derringer, Pat Benatar, John Waite, Kenny Loggins, Steve Forbert, The Del Lords, and Beth Hart. His work has produced many Grammy-nominated and Grammy-winning hits, and he holds the distinction of being the first guitar player appearing on MTV. Today, he continues to expand his creative portfolio: in addition to writing new songs for stage and screen, he is writing screenplays for feature films, touring, and reaching out into the community to work with musicians young and old. Read more about Neil Giraldo here. Neil Giraldo was born in 1955 in Cleveland, Ohio. Immersed in the culture of his beloved Sicilian ancestry, his parents Anthony and Angela Giraldo instilled the love of music at a young age, giving Neil his first guitar at the age of six, with the hopes that he and his sister, Priscilla, who played the accordion, could entertain family and friends with songs from the old country after church on Sundays. As Neil got older, his mentor, Uncle Tim, introduced him to revolutionary bands like The Yardbirds, The Kinks, The Rolling Stones, and all the other great guitar-driven rock ‘n’ roll bands of the 1960s. Finding new and innovative ways to shadow path his way into songs, Neil developed a discipline early on of not just playing along to his favorite artists but creating different parts for himself within those tracks. At the same time, the budding guitar artist also became proficient on piano by continuously practicing along to Chuck Berry (Johnnie Johnson), Fats Domino and Jerry Lee Lewis records. His interest in percussion instruments soon followed, practicing the drums to Simon & Garfunkel albums he explored how different rhythms could alter the complexion of songs. These practices and disciplines created the foundation for his future success as an innovative record producer and musician. With a back catalog of more than 100 songs written and more than 45 million records sold, Giraldo has written, produced, arranged, and recorded for Pat Benatar, John Waite, Rick Springfield, Kenny Loggins, Steve Forbert, The Del Lords, Beth Hart, The Coors, and others, which include many Grammy-nominated and Grammy-winning hits. Today, Giraldo’s career is as dynamic and diverse as ever. He is in the process of completing two books – one an autobiographical novel, one a motivational book on the psychology of creating. He is further expanding his Bel Chiasso entertainment company, which is developing a variety of television and film projects. He is performing in a new band project with Scott Kempner from the Del Lords/Dictators and is putting together an all-star Steel Bending Spirits, LLC band. 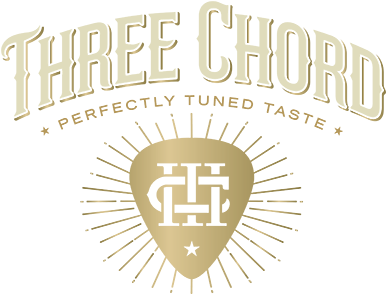 And now Giraldo is bringing his creative energy and musical expertise to another project as the founder of Three Chord Bourbon, which uses rhythmic disruption to alter and enhance the molecular structure of bourbon, a process he calls Perfectly Tuned Taste. Inspired by music, enhanced by technology, Three Chord Blended Bourbon Whiskey embodies the spirit of creativity and innovation.